Houston Street, we have a problem. 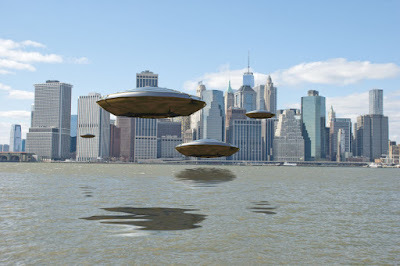 In all, there have been 27 spacey sightings in Manhattan since 2016, with Brooklynites close behind, reporting 24 strange objects — from a “very bright, round-shaped light in the sky” to a “fireball” of lights. Queens denizens described 20 unexplained episodes, with a particularly impressive arrival last June. “Group of about 7 UFOs, with a leader to the side, and a cluster to its north,” one witness reported. Just eight mysterious incidents originated out of the Bronx, while Staten Island residents got interstellar a paltry six times. “Surprised a UFO that was hovering silently above me, then it shot away,” one Staten Islander shrugged last January. The center’s director is confident that the truth is out there. “Good photos, reliable photos” of UFOs are “scarce” because people have just seconds to capture “objects capable of moving at tremendous speeds,” he explained. The group says it has catalogued more than 128,000 mysterious sightings worldwide since 1974, with most in the United States — 13,033 — originating in California. New York has collected just 4,500 in that time.